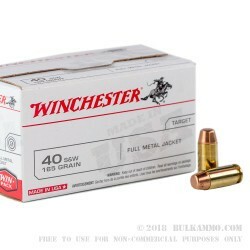 Such a solid performing cartridge, the Winchester White Box .40 S&W ammunition is a mainstay because it never performs poorly. 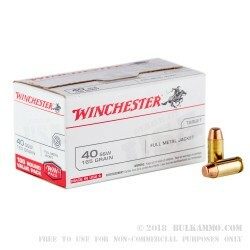 The clean consistency of the Winchester White Box line has proven itself for decades. 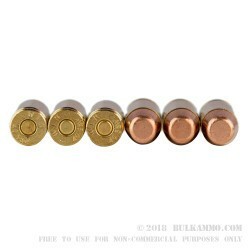 It is the preeminent value line ammunition in America, and probably much further. This .40 Smith & Wesson 165 grain load is a nice compromise between good velocity, and snappy reliable performance in your range sessions. A solid velocity rating at 1,060 feet per second, and a hard hitting 410 ft. lbs. of energy, this is quite a hot round by most standards, which contributes heavily to feeding, extraction and functionality as a whole. The full metal jacket with a flat nose is the status quo projectile for the .40 S&W. The brass casing and boxer priming is easy to reload giving the shooter a value added bonus for choosing such a proven round. The price of Winchester White Box is already competitively priced with the cheaper imports; giving it the obvious upper hand, given it’s proven performance and reliability. A range dynamo, this is a hard fought contender for your shooting dollars. If you are a fan of uninterrupted shooting sessions that end without remorse for dollars spent, then this is a true candidate.